FEATURED IN: CorroLogic CorrPlug Caps from Cortec Protect Pipes Against Corrosion Featured in Fabricator Magazine! FEATURED IN: Product Snapshot: Pipe End Caps and Ride-on Trowel Featured in ENR Magazine! FEATURED IN: Cortec® Designs Low Conductivity / Low Sodium Corrosion Inhibitor for Generator Stator Cooling Systems and Nuclear Applications Featured in IPCM Magazine! FEATURED IN: Cortec® Designs Low Conductivity / Low Sodium Corrosion Inhibitor for Generator Stator Cooling Systems and Nuclear Applications Featured in IMD Magazine! FEATURED IN: Cortec Designs Low Conductivity / Low Sodium Corrosion Inhibitor for Generator Stator Cooling Systems and Nuclear Applications Featured in IPCM Magazine! FEATURED IN: Cortec Designs Low Conductivity / Low Sodium Corrosion Inhibitor for Generator Stator Cooling Systems and Nuclear Applications Featured in Informed Magazine! FEATURED IN: VpCI-648 Water Treatment Featured in CTE Magazine! FEATURED IN: Cortec Designs Low Conductivity / Low Sodium Corrosion Inhibitor for Generator Stator Cooling Systems and Nuclear Applications Featured in SMT Magazine! TECHNICAL PAPER: Amine Base Vapor Phase Corrosion Inhibitor Alternatives to Hydrazine for Steam Generating Systems Featured in Material Performance! FEATURED IN: Continuous Corrosion Protection Featured in Crown Publications! FEATURED IN: Tips for Industrial Boiler Lay-Up Featured in Process Heating Magazine! NEWS ALERT: Cortec® Encounters Unexpected Opportunities and Offers Corrosion Solutions for all at Power-Gen®*! FEATURED IN: Protecting Cooling Systems from Corrosion during Winter Layup featured in Water World! FEATURED IN: Impregnated Foam Tapes Provide Corrosion Protection Featured in EPT Magazine! FEATURED IN: Corrosion Protection for Marine Nav Equipment Featured in Maritime Reporter and Engineering News! FEATURED IN: Cortec CorrLube VpCl Lithium EP Grease Provides Corrosion Resistance for Electrical Connections Featured in Power Engineering Magazine! FEATURED IN: MCI-2012 IntegraPel Featured in Power Engineering Magazine! 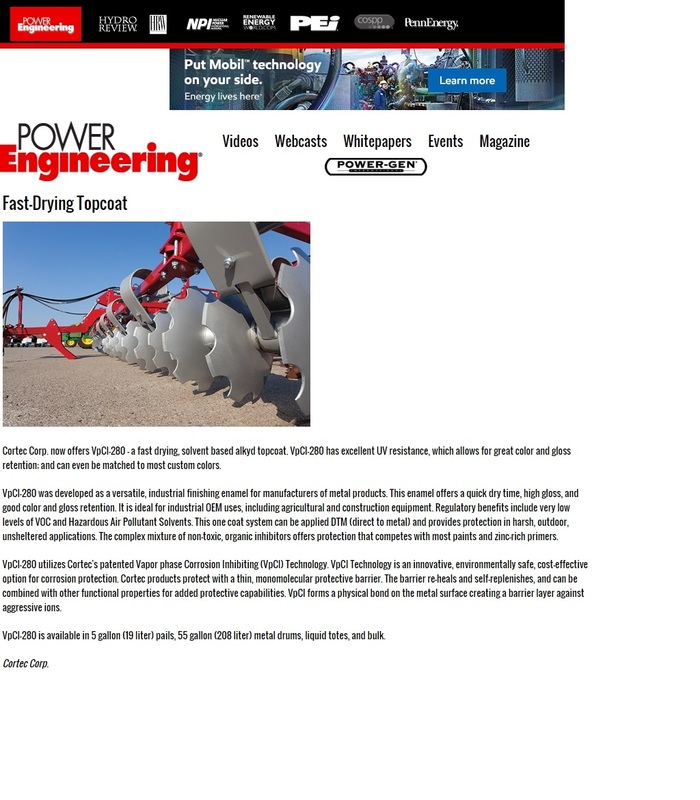 FEATURED IN: Cortec VpCI®280 Featured in Power Engineering Magazine! 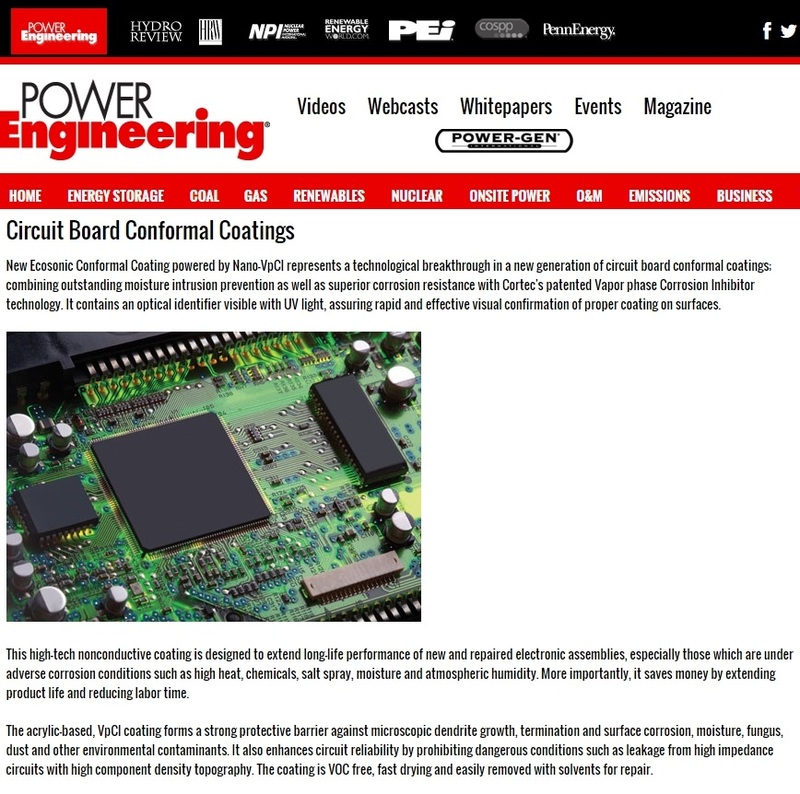 FEATURED IN: Ecosonic Conformal Coating Powered By Nano-VpCI Featured in Power Engineering Magazine! PRESS RELEASE: Cortec’s Publishes “VpCI® Technology for Electric Power Industry” – A New Resource Brochure For The Electric Power Industry!